Nick and Joey discuss the etyomology of the word banquet. Joey makes Nick take a nip, then the boys play a round of "You Don't Hear That Anymore." Flunk Dawg joins Nick for a discussion on weddings, travel, and good eatin’. PLUS, a homemade Pairable or Terrible. Devon Glocke returns to the show to talk movies. Nick complains about the airport. Hiking, skiing, and making time for the fulfilling things in life. The boys are back to a normal episode. And the only problem is there were issues with the recording, so it skips around a bit. See if you can follow along. (An apt metaphor for Cold Cans, as a whole.) PLUS, new beer tiers are introduced. Joey is back in the studio with Matt on the ones and twos. His new friend Brody O’Vac joins the show to talk about the charger community and his 84th-story penthouse in Tokyo. Joey is reunited with an old friend. The entertainment podcast Cold Cans is back from hiatus. Nick fills his contractual obligation to host the show with his new friend, meat inventor Brett Cavre. The boys drink a Chicago beer and welcome back Matt on the ones and twos to discuss bread and sandwiches. Joey brings a Glocke Gripe and Nick makes chili chili. Busch Light is at the foundation of Cold Cans. On this special episode, the boys watch the Brewers-Dodgers playoff matchup and review the classic light piss that started it all. We cannot experience light without darkness, or darkness without light. On the fall equinox, the first day of the Libra season, the boys are joined by new engineer Matt to drink an Overcast Espresso Stout for a beautiful, tangible reminder of this fact. 69 - Family Vacation Beer! Travel separates them. Beer brings them back together. The boys are BACK with tales from the road, breaking news on Joey’s back, and a beer the whole family will love. The best pilsner yet. The boys try a live feed and call Casey. The boys drink a Foster's, which in Australian means beer. They do the minion dance. One special guest. Two pairable or terribles. And there's no piss in the beer. The boys are out of the studio...and out of their minds. The boys analyze yet another member of the Budweiser family. You've gotta see that blue bottle, which can not be recycled in most areas. This episode went platinum. It's like a bloody mary but with beer. The most premium Pairable or Terrible in CC history. The boys think a real michelada might taste ok.
Joey is back from Wisconsin with some stories to tell. The boys get cultured by returning guest Brooks Erickson. Jesse Ventura surfaces to talk about communism. Joey is on pilgrimage so the boys call in friend-of-the-show and family-of-the-show, Zach, off the bench. Nick tells a long story. It feels like summer. You don't have to be anxious all the time. Life is hazy. It's a time for celebration as the boys discuss beerball tournaments, the beauty of beer drinking, and birthdays. It's Christmas in April as the boys learn the origin of Stella Artois and give too much commentary on the hit film, A Quiet Place. The boys are back from hiatus and anxious to talk airplanes, Texas, and that voicemails episode. Joey reconciles with WhirlyBall. INTERNAL NOTE: TEMPORARILY STORING THESE RECORDINGS HERE. DO NOT RELEASE THESE RECORDINGS. REPLACE WITH ANOTHER EPISODE. BUD LIGHT LIME IS/WAS BRIAN'S FAVORITE BEER. ADDRESS THE #WHERESTHEBOY SCANDAL. It's the big number 50 and the boys are joined by a special guest to celebrate the occasion. Joey takes down malls. An episode entirely devoted to our good friend @stoughtiak. A chance encounter with a Wisconsin connection leads Joey down a path to this Texas brew. Everything's bigger on this episode. The boys did another back to back. There's singing. The boys drink to fossils, the Midwest, and not cussing. A new branch of science is discovered. Cold Cans Nation is called upon in a time of crisis. Special appearance by a former guest. The boys are riding a tandem bicycle down the street called Quality Beer Street. Phil Woodman and his son make their debut. Optimism Brewery is making a name for itself in the Capitol Hill neighborhood of Seattle. But optimism, as a concept, is very new to the Cold Cans boys. Two worlds collide as the boys chat with the founders of Optimism Brewery over a trio of delicious beers. The boys set the record for the Coldest Can ever consumed. The rankings are out of whack. Time for a Rankings Reconciliation. It's the final Cold Cans of 2017 and the boys finally learn something about beer. Pyramid Brewing's Head Brewer, Ryan Pappe, joins the show to give Cold Cans Nation the inside scoop on Pyramid's Snow Cap collection. Sparks was the first "energy beer" on the market. It might be the last beer in the boys' gullets. The boys talk craft hummus, sports talk radio, and Subway. A new Beer Tier system is introduced. The boys drink a Sam Adams Boston Lager and eat a special Thanksgiving treat on Pairable or Terrible. Nick encounters too much shrimp at the grocery store and Joey recommends a show on Hulu. Boots on the ground, voice on the podcast. Casey joins Nick in central Wisconsin for a special Road Buddies edition of Cold Cans. The boys talk Milwaukee and do too many raps. This is not your father's Cold Cans. Nic-ghoul-aus and Booey are joined by special guest Devil Ghoul-cke for an Elysian Night Owl on a spooky scary edition of Mold Cans. Drink Schlitz or I'll kill you. Beers and bullshitting--it's the natural pair. The boys get back to their rambling roots with a crisp, sessionable lager that doesn't skimp on the ABV. So get a beer, grab a chair, and tune in before the sea levels rise and kill us all. The boys discover that #itgetsbetter, thanks to a warming bottle of Heineken. Joey defends Uncrustables. PLUS: A bombshell involving Beer Advocate. Who says you can't drink cold cans in cold weather? The boys are joined by special guest Spencer Morris, who brings along his favorite winter-time beer--and it's a thick one. Grocery store lines are debated at length. The boys finally drink the blue ribbon winner. A popular segment is renamed, and the question on everyone's minds is revealed: who is Brian's real father? The hoppiest IPA in Cold Cans history is reviewed. The hustle of life is examined. The boys get into a fight. It's #spottedcowweek and the boys are joined by special guest and Spotted Cow superfan Devon Glocke to break down the best beer in Wisconsin. Devon roasts the DMV, Nick fires off a scorching-hot take, and Joey discusses the amenities of the sea. The boys are sick of The Man keeping them down, calories adding up, and beer tasting good. On their quest to turn into efficient American machines, they look to Michelob Ultra. It's Blatz week! The boys get nostalgic over the liquid gold and enlist the help of lead researcher Casey Reierson, who attends Blatzfest. With the help of the Princess Queen of Pineapples, herself, the boys analyze this fruit-forward, refreshing ale. Special guest Brittaney Bunjong talks about her favorite beers and gives advice on pairing beer with food. The studio is flooded (investigation ongoing), so the boys are drinking beers in a conference room. What better setting for a beer considered one of the best in the world? The guys actually talk about beer for some of the show as they discuss brewery tours and the beauty of brew pubs. Nick talks about the time he witnessed a bar fight in Bend, Oregon. "To be happy, consume our product." Do we need to fit into societal pressures, beauty standards, and skinny jeans? The guys investigate while staying hydrated with a Miller 64. Say it with us now: Schöfferhofer Hefeweizen Grapefruit Bier! Great, now you owe the trademark holder five cents...The boys discuss copyright and intellectual property while sipping on that smooth, summertime beverage. "33" What does it mean? The guys discuss the shocking results of their investigations into the meaning behind the mysterious "33" printed on every bottle and can of Rolling Rock. They also drink a Rolling Rock. Getting iced is not so nice. The boys gut through that syrupy, viral sensation--Smirnoff Ice. "Everybody's an expert." The boys, who are expert beer reviewers, take on the concept of ranking subjective experiences, like tasting beer, while they taste a beer (finally, a decent one). Liquid Aloha. The guys are drinking Longboard Lager to see if a sip of paradise is enough to cure those wintertime blues. Beers, Not Bears. Joey and Nick get knocked down, get back up again, then rate and review the PNW classic, Rainier. 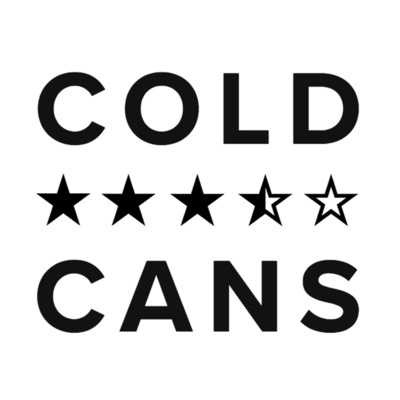 Cold Cans goes to Canada. The boys go bottoms up with a beer that's big north of the border, with a special guest appearance from two Canadian Correspondents -- Braden (@avs1933) and Nik. Changes. Joey and Nick discuss the evolution of the Olympia beer brand, which leads into a look at their own personal journeys through life so far. Welcome to Cold Cans. The guys kick off their journey to find the top 100 beers of all time with a taste of the legendary brew that's close to their hearts--Miller Lite.